Forego the busy national park crowds and experience rare sights in the heart of the Grand Canyon at Bar 10 Ranch. 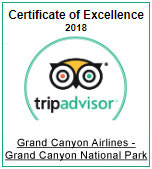 This Grand Canyon Airlines exclusive tour brings you to the virtually unexplored North Canyon and provides an unmatched Grand Canyon sightseeing experience from a unique vantage point. Head off the beaten path on a Polaris Ranger and travel along a 4×4 trail through Whitmore Canyon and Lake Mead Recreation Area to the canyon rim. At 3,000 feet (880 m) above the Colorado River, the sheer drop from the rim at this part of the canyon offers rare and spectacular views. You'll also have time to explore the unusual collection of desert vegetation and animal life. Return to Bar 10 Ranch and enjoy the staff’s hospitality as well as a home-cooked Dutch oven barbecue lunch. You'll fly to and from Bar 10 Ranch aboard one of our aircraft specifically designed for “flightseeing.” All airplanes are equipped with high wings to provide optimal viewing, along with a climate-controlled cabin for your comfort. Enjoy the picturesque views over Hoover Dam, Lake Mead, and the mighty Colorado River along the way. As with all of our tours, you'll receive complimentary round-trip shuttle service from Las Vegas to our Boulder City air terminal. Explore our gift shop where souvenir photos are available for purchase. This outdoor adventure in the rugged wilderness of the North Canyon will provide a lifetime of memories for you and your family. *Add An ATV When You Book Your Tour! Breathe in the mountain air and experience a thrilling ATV ride through Whitmore Canyon and Lake Mead Recreational Area all the way to the northern rim of the Grand Canyon. * Boots or sturdy shoes are required (no open-toed shoes, sandals, high heels or flip-flops are permitted). * ATV riders must be a minimum of 16 years of age with a valid driver’s license. * One person is permitted per ATV. Travel on a Polaris Ranger along a 4x4 trail through Whitmore Canyon and Lake Mead Recreation Area to the canyon's edge. Explore this exclusive part of the canyon that only Bar 10 Ranch guests can access. Return to Bar 10 Ranch. Relax and enjoy a delicious homemade Dutch oven barbecue lunch.